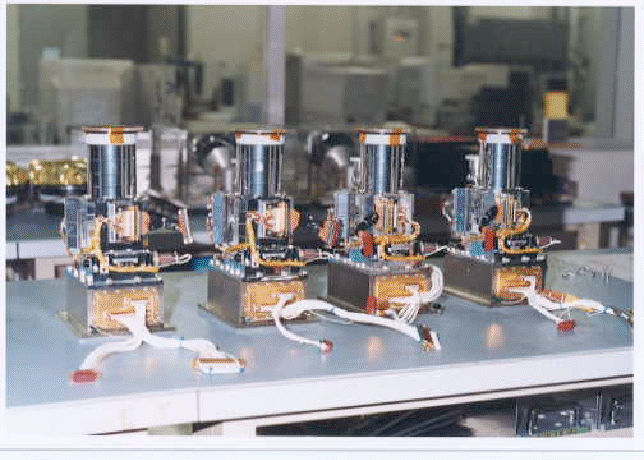 Figure 6.1: The four XIS detectors before installation onto Suzaku. 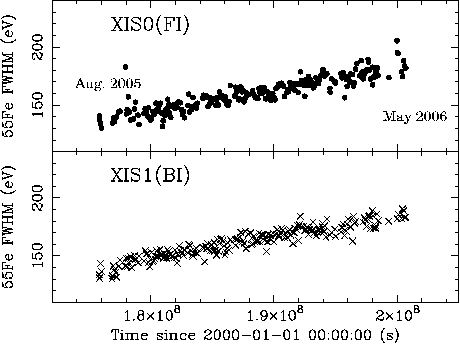 Suzaku has four X-ray Imaging Spectrometers (XISs), which are shown in Figure 6.1. These employ X-ray sensitive silicon charge-coupled devices (CCDs), which are operated in a photon-counting mode, similar to that used in the ASCA SIS, Chandra ACIS, and XMM-Newton EPIC. In general, X-ray CCDs operate by converting an incident X-ray photon into a charge cloud, with the magnitude of charge proportional to the energy of the absorbed X-ray. This charge is then shifted out onto the gate of an output transistor via an application of time-varying electrical potential. This results in a voltage level (often referred to as ``pulse height'') proportional to the energy of the X-ray photon. The four Suzaku XISs are named XIS0, 1, 2 and 3, each located in the focal plane of an X-ray Telescope; those telescopes are known respectively as XRT-I0, XRT-I1, XRT-I2, and XRT-I3. Each CCD camera has a single CCD chip with an array of 1024 1024 picture elements (``pixels''), and covers an region on the sky. Each pixel is 24 m square, and the size of the CCD is 25 mm 25 mm. One of the XISs, XIS1, uses a back-side illuminated CCDs, while the other three use front-side illuminated CCDs. The XIS has been partially developed at MIT (CCD sensors, analog electronics, thermo-electric coolers, and temperature control electronics), while the digital electronics and a part of the sensor housing were developed in Japan, jointly by Kyoto University, Osaka University, Rikkyo University, Ehime University, and ISAS. Figure 6.2: One XIS instrument. Each XIS consists of a single CCD chip with X-ray sensitive cells, each 24 m square. Suzaku contains four CCD sensors (XIS0 to 3), two AE/TCUs (AE/TCE01 and AE/TCE23), two PPUs (PPU01 and PPU23), and one MPU. AE/TCU01 and PPU01 service XIS0 and XIS1, while AE/TCE23 and PPU23 service XIS2 and XIS3. Three of the XIS CCDs are front-illuminated (FI) and one (XIS1) is back-illuminated (BI). A CCD has a gate structure on one surface to transfer the charge packets to the readout gate. The surface of the chip with the gate structure is called the ``front side''. A front-side illuminated CCD (FI CCD) detects X-ray photons that pass through its gate structures, i.e. from the front side. Because of the additional photo-electric absorption at the gate structure, the low-energy quantum detection efficiency (QDE) of the FI CCD is rather limited. Conversely, a back-side illuminated CCD (BI CCD) receives photons from ``back,'' or the side without the gate structures. For this purpose, the undepleted layer of the CCD is completely removed in the BI CCD, and a thin layer to enhance the electron collection efficiency is added in the back surface. A BI CCD retains a high QDE even in sub-keV energy band because of the absence of gate structure on the photon-detection side. However, a BI CCD tends to have a slightly thinner depletion layer, and the QDE is therefore slightly lower in the high energy band. The decision to use only one BI CCD and three FI CCDs was made because of both the slight additional risk involved in the new technology BI CCDs and the need to balance the overall efficiency for both low and high energy photons. Fig. 6.2 provides a schematic view of the XIS system. The Analog Electronics (AE) drives the CCD and processes its data. Charge clouds produced in the exposure area in the CCD are transferred to the Frame Store Area (FSA) after the exposure according to the clocks supplied by the AE. The AE reads out data stored in the FSA sequentially, amplifies the data, and performs the analog-to-digital conversion. The AE outputs the digital data into the memory in PPU named Pixel RAM. Subsequent data processing is done by accessing the Pixel RAM. To minimize the thermal noise, the sensors need to be kept at C during observations. This is accomplished by thermo-electric coolers (TECs), controlled by TEC Control Electronics, or TCE. The AE and TCE are located in the same housing, and together, they are called the AE/TCE. Suzaku has two AE/TCEs; AE/TCE01 is used for XIS0 and 1, and AE/TCE23 is used for XIS2 and 3. 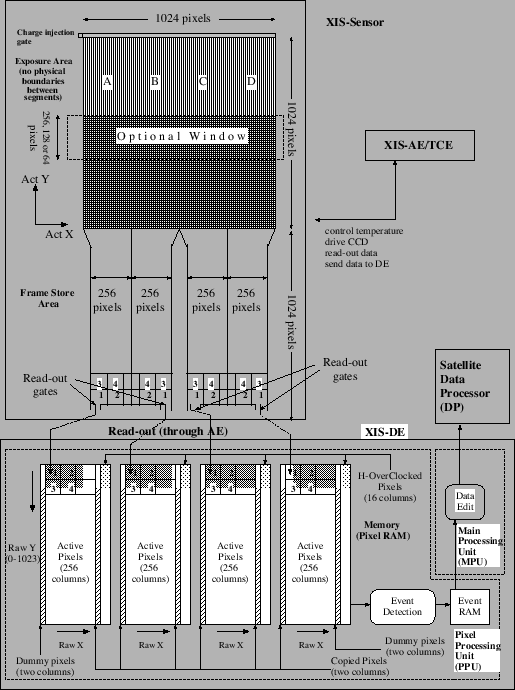 The digital electronics system for the XISs consists of two Pixel Processing Units (PPU) and one Main Processing Unit (MPU); PPU01 is associated with AE/TCE01, and PPU23 is associated with AE/TCE23. The PPUs accesses the raw CCD data in the Pixel RAM, carry out event detection, and send event data to the MPU. The MPU edits and packets the event data, and sends them to the satellite's main digital processor. To reduce contamination of the X-ray signal by optical and UV light, each XIS has an Optical Blocking Filter (OBF) located in front of it. The OBF is made of polyimide with a thickness of 1000 Å, coated with a total of 1200 Å of aluminum (400 Å on one side and 800 Å on the other side). To facilitate the in-flight calibration of the XISs, each CCD sensor has two Fe calibration sources 6.1. These sources are located on the side wall of the housing and are collimated in order to illuminate two corners of the CCD. They can easily be seen in two corners of each CCD. A small number of these X-rays scatter onto the entire CCD. After the launch of Suzaku, we have operated the four XISs successfully for more than a year. However, we had to adapt the XIS operation to the flight performance of the CCD, which included unforeseen phenomena. The XIS had unexpectedly large contamination on the OBF from some material in the satellite. This reduced the low-energy efficiency of XIS significantly. We monitor the contamination thickness by observing the calibration targets (eg. 1E0102-72, RXJ1856.5-3754) regularly. This effect is included in the response matrices. It is known that the CCD performance gradually degrade in space due to the radiation damage. This is because the charge traps are produced by cosmic-rays and are accumulated in the CCD. One of the unique features of XIS is the capability to inject small amount of charge to the pixels. Charge injection is quite useful to fill the charge traps periodically, and to make them almost harmless. The charge injection is adopted as a standard method in AO2 to cope with the increase of the radiation damage. Details of the contamination and the charge injection are explained later. A single XIS CCD chip consists of four segments (marked A, B, C and D in Fig. 6.2) and correspondingly has four separate readout nodes. Pixel data collected in each segment are read out from the corresponding readout node and sent to the Pixel RAM. In the Pixel RAM, pixels are given RAWX and RAWY coordinates for each segment in the order of the readout, such that RAWX values are from 0 to 255 and RAWY values are from 0 to 1023. These physical pixels are named Active pixels. In the same segment, pixels closer to the read-out node are read-out faster and stored in the Pixel RAM faster. Hence, the order of the pixel read-out is the same for segments A and C, and for segments B and D, but different between these two segment pairs, because of the different locations of the readout nodes. In Fig. 6.2, numbers 1, 2, 3 and 4 marked on each segment and Pixel RAM indicate the order of the pixel read-out and the storage in the Pixel RAM. In addition to the Active pixels, the Pixel RAM stores the Copied pixels, Dummy pixels and H-Over-Clocked pixels (cf. Fig. 6.2). At the borders between two segments, two columns of pixels are copied from each segment to the other. Thus these are named Copied pixels. On both sides of the outer segments, two columns of empty Dummy Pixels are attached. In addition, 16 columns of H-Over-Clocked pixels are attached to each segment. Actual pixel locations on the chip are calculated from the RAW XY coordinates and the segment ID during ground processing. The coordinates describing the actual pixel location on the chip are named ACT X and ACT Y coordinates (cf. Fig. 6.2). It is important to note that the RAW XY to ACT XY conversion depends on the on-board data processing mode (cf. § 6.4). When a CCD pixel absorbs an X-ray photon, the X-ray is converted to an electric charge, which in turn produces a voltage at the analog output of the CCD. This voltage (``pulse-height'') is proportional to the energy of the incident X-ray. In order to determine the true pulse-height corresponding to the input X-ray energy, it is necessary to subtract the Dark Levels and correct possible optical Light Leaks. Dark Levels are non-zero pixel pulse-heights caused by leakage currents in the CCD. In addition, optical and UV light might enter the sensor due to imperfect shielding (``light leak''), producing pulse heights that are not related to X-rays. Analysis of the ASCA SIS data, which utilized the X-ray CCD in photon-counting mode for the first time, showed that the Dark Levels were different for different pixels, and their average did not necessarily follow a gaussian. On the other hand, Light Leaks are considered to be rather uniform over the CCD. For the Suzaku XIS, Dark Levels and Light Leaks are calculated separately in normal mode. Dark Levels are defined for each pixel; those are expected to be constant for a given observation. The PPU calculates the Dark Levels in the Dark Initial mode (one of the special diagnostic modes of the XIS); those are stored in the Dark Level RAM. The average Dark Level is determined for each pixel, and if the dark level is higher than the hot-pixel threshold, this pixel is labeled as a hot pixel. Dark Levels can be updated by the Dark Update mode, and sent to the telemetry by the Dark Frame mode. Analysis of the ASCA data showed that Dark Levels tend to change mostly during the SAA passage of the satellite. Dark Update mode may be employed several times a day after the SAA passage. Hot pixels are pixels which always output over threshold pulse-heights even without input signals. Hot pixels are not usable for observation, and their output has to be disregarded during scientific analysis. XIS detects hot pixels on-board by the Dark Initial/Update mode, and their positions are registered in the dark Level RAM. Thus, hot pixels can be recognized on-board, and they are excluded from the event detection processes. It is also possible to specify the hot pixels manually. There are, however, some pixels which output over threshold pulse-heights intermittently. Such pixels are called flickering pixels. It is difficult to identify and remove the flickering pixels on board; they are inevitably output to the telemetry and need to be removed during the ground processing. Flickering pixels sometimes cluster around specific columns, which makes it relatively easy to identify. The Light Leaks are calculated on board with the pulse height data after the subtraction of the Dark Levels. A truncated average is calculated for pixels (this size was before January 18, 2006) in every exposure and its running average produces the Light Leak. In spite of the name of Light Leak, Light Leak does not represent in reality optical/UV light leak to the CCD. It mostly represents fluctuation of the CCD output correlated to the variations of the satellite bus voltage. XIS has little optical/UV light leak, which is negligible unless the bright earth comes close to the XIS field of view. The Dark Levels and the Light Leaks are merged in the parallel-sum (P-Sum) mode, so Dark Update mode is not available in P-Sum mode. The Dark Levels, which are defined for each pixel as the case of the normal mode, are updated every exposure. It may be considered that the Light Leak is defined for each pixel in P-Sum mode. The main purpose of the on-board processing of the CCD data is to reduce the total amount transmitted to ground. For this purpose, the PPU searches for a characteristic pattern of charge distribution (called an event) in the pre-processed (post- Dark Levels and Light Leaks subtraction) frame data. When an X-ray photon is absorbed in a pixel, the photoionized electrons can spread into at most four adjacent pixels. An event is recognized when a valid pulse-height (one between the Event Lower and Upper Thresholds) is found that exceeds the pulse-heights in the eight adjacent pixels (e.g. it is the peak value in the pixel grid). In P-Sum mode, only the horizontally adjacent pixels are considered. The Copied and Dummy pixels ensure that the event search is enabled on the pixels at the edges of each segment. The RAW XY coordinates of the central pixel are considered the location of the event. Pulse-height data for the adjacent square pixels (or in P-Sum mode 3 horizontal pixels) are sent to the Event RAM as well as the pixel location. The MPU reads the Event RAM and edits the data to the telemetry format. The amount of information sent to telemetry depends on the editing mode of the XIS. All the editing modes (in normal mode; see §6.5) are designed to send the pulse heights of at least 4 central pixels of an event to the telemetry, because the charge cloud produced by an X-ray photon can spread into at most 4 pixels. Information of the surrounding pixels may or may not output to the telemetry depending on the editing mode. The mode outputs the most detailed information to the telemetry, i.e. all 25 pulse-heights from the pixels containing the event. The size of the telemetry data per event is reduced by a factor of 2 in mode, and another factor of 2 in mode. Details of the pulse height information sent to the telemetry are described in the next section. There are two different kinds of on-board data processing modes. The Clock modes describe how the CCD clocks are driven, and determine the exposure time, exposure region, and time resolution. The Clock modes are determined by a kind of program (``micro-code'') loaded to the AE. The Editing modes specify how detected events are edited, and determine the formats of the XIS data telemetry. Editing modes are determined by the digital electronics. It is possible to select different mode combinations for the four XISs independently. However, we expect that most observations will use all four in Normal 5 5 or 3 3 Mode (without Burst or Window options). Other modes are useful for bright sources (when pile-up or telemetry limitations are a concern) or if a higher time resolution ( 8 s) is required. There are two kinds of Clock Modes in XIS, i.e. Nomal and Parallel Sum Modes. Furthermore, two options (Window and Burst options) may be used in combination with the Normal Mode. However, see §6.5.3 for the restriction in the usage of the Parallel Sum Mode. Normal Mode: If neither Window nor Burst option (see below) is specified, the exposure time is 8 seconds, and all the pixels on the CCD are read out every 8 seconds. This can be combined with either of the 5 5, 3 3, and 2 2 Editing modes. Parallel Sum Mode: The pixel data from multiple rows are summed in the Y-direction on the CCD, and the sum is put in the Pixel RAM as a single row. The number of rows to add is commandable, but only 128-row summation is supported at present. Parallel Sum mode can be used only with the Timing Editing mode, and the Y coordinate is used to determine the event arrival time. As a result, no spatial resolution is available in the Y-direction. The time resolution of the Parallel Sum Mode is 8 s/1024 7.8 ms.
Table 6.1 indicates how the effective area and exposure time are modified by the Burst and Window options. In the Normal Clock mode, the Window and Burst options can modify the effective area and exposure time, respectively. The two options are independent, and may be used simultaneously. These options cannot be used with the Parallel Sum Clock mode. Burst Option: All the pixels are read out every 8 seconds (if the Window option is not specified), but the exposure time can be reduced by a factor of ( ) from the nominal 8 s. This option may be used to avoid photon pile-up when observing a bright source. However, a dead time is introduced in the exposure. If the exposure is s, there is a s dead-time every 8 s.
Window Option: This option allows shorter exposure times by reading out more frequently only a portion of the CCD. Only the parts of the chip within the Y-direction range specified by the commandable Window is used for exposure (cf. Fig. 6.2). The Window width in the Y-direction is either 256, 128 pixels around the aim point. When the Window width is 256 pixels (1/4 Window), the exposure time becomes a quarter of that without the Window option (i.e. 2 s), and the Pixel RAM is filled with the data from four successive exposures. Similarly, when the Window width is 128 pixels (1/8 Window), the exposure time becomes 1/8 of that without the Window option respectively, and the Pixel RAM is filled with the data from 8 successive exposures. We show in Fig. 6.3 the time sequence of exposure, frame-store transfer, CCD readout, and storage to the pixel RAM (in PPU) in normal mode with or without Burst/Window option. Note that, when 1/8 Window option is applied, significant fraction of the source photons may be lost due to the tail of the XRT point spread function. Furthermore, the fractional loss may be modulated by the attitude fluctuation of the satellite, which is synchronized with the orbital motion of the satellite. Figure 6.3: Time sequence of the exposure, frame-store transfer, CCD readout, and data transfer to the pixel RAM in PPU is shown (1) in normal mode without options, (2) in normal mode with Burst option, and (3) in normal mode with Window option. In this example, the 1/4 Window option is assumed. Editing modes may be divided into two categories, observation modes and diagnostics modes. We describe here mainly the observation modes. General users need not use the data in diagnostic modes. Among the observation modes, three modes ( , , and ) are usable in normal modes, and only the timing mode in the P-Sum mode. mode: All the pulse heights of the 25 pixels centered at the event center are sent to the telemetry. This is used with the Normal Clock mode. mode: Pulse heights of the 9 pixels centered at the event center are sent to the telemetry with the 1-bit information (pulse height larger than the Split Threshold Outer or not) for the surrounding 16 pixels. This is used with the Normal Clock mode. mode: Pulse heights of the square pixels are sent to the telemetry. The pixels are selected to include the event center, second highest pixel in the cross centered at the event center, and the 3rd (or 4th) highest pixel in the cross. The 1-bit information (pulse height larger than the Split Threshold Outer or not) of the 8-attached pixels is also output to the telemetry. This is used with the Normal Clock mode. Timing mode: Total pulse height and the Grades of the event is output to the telemetry. Pulse heights of at most three pixels in the X-direction are summed to give the total pulse height if they are over the Inner Split Threshold. Position and number of pixels exceeding the threshold determines the Grades. This is used only with the P-Sum Clock mode. Window and Burst Options are not available in the Timing mode. We show in Fig. 6.4 the pixel pattern whose pulse height or 1-bit information is sent to the telemetry. We do not assign grades to an event on board in the Normal Clock mode. This means that a dark frame error, if present, can be corrected accurately during the ground processing even in 2 2 mode. The definition of the grades in P-Sum mode is shown in Fig. 6.5. There are slight differences between the , and modes. No significant difference is found so far between the and modes. However, mode is slightly different from or mode. The difference is produced during the CTE correction in the ground processing. Because the pulse height information is limited in the mode, some of the CTE corrections cannot be applied to the mode data. This causes slight difference in the gain and quantum detection efficiency of mode data. The XIS team may eventually need to prepare different calibration data for the mode. However, meanwhile, calibration accuracy of the mode data is slightly worse than the and mode data. The mode is employed only when a bright source is observed (see tables 6.7 and 6.8). Those who plan to observe a bright source should be aware of these systematics in mode. The mode is not used in BI CCD, because relatively large CTI in BI CCD produces significant calibration difference from and modes. In timing mode, data quality may be significantly degraded compared to the normal mode, while the calibration remains very preliminary stage. We do not expect that the calibration advances quickly in near future. Furthermore, there are some operational restrictions. From these reasons, the XIS team does not recommend to use the timing mode. Those who consider using the timing mode should use the mode at their own risk. Timing mode is available only in the FI CCDs. There are relatively large numbers of hot/flickering pixels in BI CCD, which are difficult to remove completely on board. The remained hot/flickering pixels are found to fill the telemetry easily, because a single hot pixel can produce 1024 events in 8 s in the timing mode. Because of this telemetry occupation by the hot/flickering pixels, we cannot use the timing mode in BI CCD. Note that this does not happen in normal mode. The FI CCDs have only a small number of hot/flickering pixels. However, we found that we need to sometimes reset the Dark Level for its stable update (say, once per 96 min.). This means that we cannot take very long continuous data. This may not become a practical restriction, because the data acquisition becomes intermittent anyway due to the SAA passage and the earth occultation of the target. Because only one dimensional information is available in timing mode, distinction between X-ray and non-X-ray events becomes inaccurate. This means that timing mode has significantly higher non-X-ray background than the normal mode. Although the actual background rate in timing mode is under investigation, it can be one or two orders of magnitude larger than the normal mode. Flight calibration of the timing mode is very preliminary, and many of the performance is not calibrated yet. For example, it is not verified yet whether or not its full time resolution, 7.8 ms, can be really achieved on orbit. Energy calibrations, eg. gain and energy resolution, are known to change in the timing mode. Because the CTI correction in timing mode is not possible yet in the ground processing, timing mode has significantly different gain than the (CTI-corrected) normal mode. This also degrades the energy resolution. Effective area of the CCDs may also change in the timing mode. Even a small number of hot pixels produce a relatively large number of dead area in the CCD, which reduces the effective area. This reduction could be time dependent, because some of the hot pixels often disappear and reappear. Figure 6.4: Information sent to the telemetry is shown for , , and modes. 1-bit information means whether or not the PH of the pixel exceeds the outer split threshold. 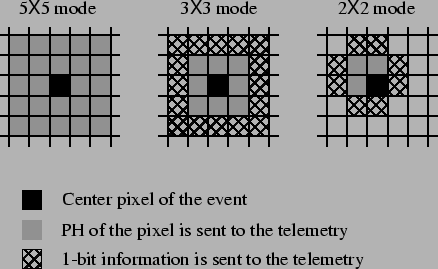 In mode, the central 4 pixels are selected to include the second and the third (or fourth) highest pixels among the 5 pixels in a cross centered at the event center. Figure 6.5: Definition of the grades in the P-Sum/timing mode. Total pulse height and the grade of the event are output to the telemetry. Note that the grades are defined referring to the direction of the serial transfer, so the central pixel of a grade 1 event has the larger RAWX value, while the opposite is true for a grade 2 event. Besides the observation modes explained above, the XIS instrument has several diagnostic modes, Frame mode, Dark Initial mode, Dark Update mode, and Dark Frame mode. Frame mode simply dumps the raw CCD data to the telemetry. This mode may be useful for the health check of the CCD. Other modes are used primarily in determining/checking the dark levels. Dark Init mode is employed when the burst/window options are changed. Dark update mode is used just after the SAA passage to update the hot pixel list on board. It is unlikely that those would be used by guest observers. Three kinds of discriminators, area, grade and class discriminators, can be applied during the on-board processing. The grade discriminator is available only in the timing mode. The class discriminator was implemented after the launch of Suzaku and was used since January, 2006. In most cases, guest observers need not to change the default setting of these discriminators. The class discriminator classifies the events into two classes, ``X-rays'' and ``others,'' and output only the "X-ray" class to the telemetry when it is enabled. This class discriminator is always enabled to reduce the telemetry usage of non-X-ray events. The ``other'' class is close to, but slightly different from grade 7. When XIS points to blank sky, more than 90% of the detected events is particle events (mostly grade 7). If we reject these particle events on board, we can make a substantial saving in telemetry usage. This is especially useful when the data rate is medium or low. The class discriminator realizes such a function in a simple manner. When all the 8 pixels surrounding the event center exceeds the Inner Split Threshold, the event is classified as the ``other'' class, and the rest of the events as the ``X-ray'' class. With such a simple method, we can reject more than three quarters of the particle events. The class discriminator works only for 5x5 and 3x3 modes. It is not available in 2x2 and timing mode. The area discriminator is used when we want to reject some (or most) of the frame data from the event extraction. The discriminator works on the Pixel RAM. When the discriminator is enabled, a part of the Pixel RAM is not used for the event extraction. This may be useful when a bright source is present in the XIS field of view other than the target source. If we set the discrimination area to include only the bright source, we can avoid outputting unnecessary events to the telemetry. Only a single, rectangular area can be specified in a segment for discrimination. Either inside or outside of the area can be rejected from the event extraction. The area discriminator works on the Pixel RAM, not for the physical area of the CCD. This is important when we apply the discriminator with the window option. The Grade discriminator is used only in the timing mode. Any combination of the 4 grades can be selected to discriminate the grade for telemetry output. Suzaku does not have the level discriminator, which was used in ASCA SIS. The same function can be realized, however, by changing the event threshold. Performance of CCD gradually degrades in the space environment due to the radiation damage by cosmic-ray particles. Spaced-row Charge Injection (CI) is used to restore the performance of CCD, especially in the charge transfer efficiency (CTE) and the energy resolution. The CI will be used in AO2 observations by default whenever it is possible. Description in this section is based on the data available as of Oct. 1, 2006. Since our knowledge and experience on the spaced-row CI are rapidly accumulating, the guest observers are recommended to visit the Suzaku web site for the latest information. 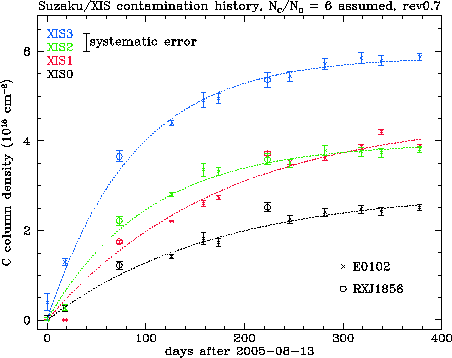 Performance of XIS is gradually degrading since the launch of Suzaku due to the radiation damage. Energy resolution at the time of writing (Sept. 2006) measured by the on-board calibration source of Fe is about 200 eV (FWHM) at 5.9 keV, while it was 130-135 eV just after the launch. In principle, a precision charge injection capability can mitigate the effects of in-flight radiation damage (Bautz et al. SPIE 2004, Vol. 5501, p111). A sufficient quantity of charge injected periodically during the array readout process (spaced-row CI) will tend to fill radiation-induced traps, and in so doing reduce the effects of these traps on the devices charge transfer efficiency (CTE). Because the traps need to be filled quite often, we inject charge every 54 rows in every exposure. The charge injected rows are not usable to detect X-ray photons, and become dead area. This method was successfully implemented in the calibration observation of 1E0102-72 and the Perseus cluster done at the end of Aug. 2006, and the energy resolution was found to recover to approximately 150 eV at 6 keV. 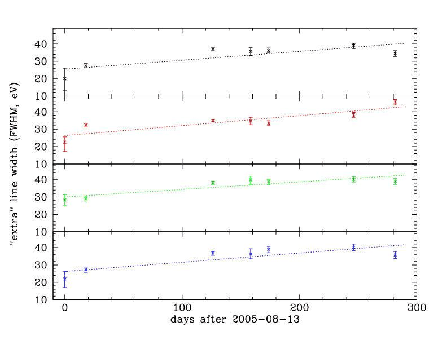 Although the spaced-row CI is effective to recover the energy resolution in the iron band, its effect is not investigated yet in low energy band especially below 1 keV as of Oct. 1, 2006. However, according to the analysis of the corner pixel distribution, which is a good measure of the excess noise after the Dark Level subtraction, no significant change is found in the distribution even with the CI. This means that the CI would not degrade the energy resolution even at very low energy. Further calibration of CI on the low-energy performance is in progress. 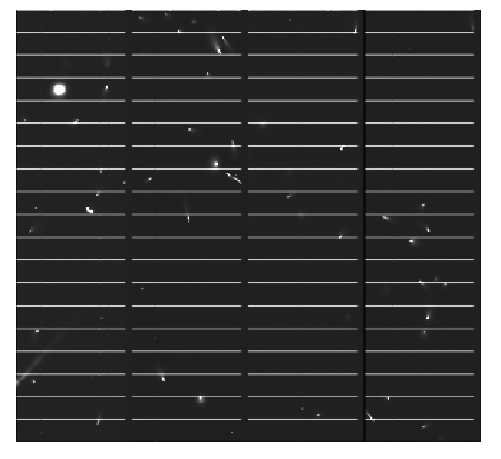 Figure 6.6: The frame mode data of XIS2 taken with spaced-row CI. The bright lines at every 54 row correspond to the charge injected lines. The lines are disconnected because the overclocked regions are also displayed at the segment boundaries. As of Oct. 1, 2006, spaced-row CI is applicable only for the normal mode. Application of CI in combination with the burst, window, window burst options is under investigation now. However, we expect that the spaced-row CI may be available simultaneously with the burst and the window options. Latest information on the availability of the CI may be found in the Suzaku web page. Spaced-row CI is not applicable to the timing mode. Here we summarize how the CI affects the data compared when no CI is used. There are several demerits associated with the CI. Guest observers should be aware of these characteristics of the CI data. Energy resolution will improve from 200-220 eV (FWHM) to 140-150 eV at the iron band. Energy resolution may be improved also at lower energies, but the improvement is not verified yet at the time of writing. Dead rows are produced every 54 row. The width of the dead line is 3 and 4 rows for the FI and BI sensor, respectively. The dead lines are fixed in RAWX, RAWY coordinate and are common to all the sensors. This means that the dead area will be 5.6% (for FI) and 7.4% (for BI) of the image. Because the width of the dead area is much smaller than the point-spread-function of the XRT and satellite attitude fluctuates, we believe that these dead area would not hamper the image analysis. Out-of-time events will increase. It takes about 25 ms to transfer the image area data to the frame-store area when no CI is implemented. This will increase to 156 ms when spaced-row CI is used. This means that the fraction of the out-of-time events increases from 0.3% to 2.0%. Number of hot pixels slightly increase with the spaced-row CI. This may introduce slight increase of the dead area due to the hot pixels, but the increase is negligible compared to the dead area due to the injected charge itself. Some of the analysis software might not be available even if the AO2 data are distributed to the guest observers. XIS team will try to finish the calibration of the CI data and to prepare the required analysis software by the start of AO2. However, it is difficult to predict at this stage when the team can finish preparing the analysis software. Please consult the Suzaku web site for the latest status of the analysis software. The good low energy response is an important unique feature of the XIS. However, we noticed the effective area below 2 keV has been decreasing with time after the launch. The degradation is characterized by the additional absorption of carbon-dominated material. The thickness of this extra absorber is different for each sensor, but takes maximum at the center of the XIS CCD and decreases toward the edge of the field of view. Although the origin of the extra absorber has not yet been identified, we consider it is most likely some contaminant accumulating on the surface of the XIS optical blocking filters (OBF), which is one of the coldest parts inside the satellite. In order to examine this efficiency degradation, we have observed soft and stable X-ray sources, such as, 1E0102-72, RXJ1856.5-3754, and the Cygnus loop, repeatedly. Atmospheric fluorescent lines of nitrogen and oxygen are also useful to evaluate the spatial dependence of the contaminant thickness over the CCD. Analysis of these data lead to our current knowledge of the extra absorber (or the contaminant on the OBF), as summarized below. The extra absorber is made mainly of carbon. The absorber also contains oxygen, but its contribution is less than 1/5 of carbon in number. Figure 6.7 shows the time evolution of the extra absorber thickness plotted as a function of time after the XIS door open. The evolution seems gradually slow down and is almost saturated 200-300 days after the XIS door open. The solid curves are the best-fit exponential functions to the data, whose time constants are 90-220 days. Note that the absorber thickness in this plot is measured at the center of the FOV, where the absorber thickness is maximum. Spatial distribution of the absorber thickness for XIS1 (BI-CCD) is shown in Figure 6.8 as a function of the distance from the FOV center. The extra absorber is thinner near the edge of the FOV. This radial profile and its time evolution is approximated with a simple analytic function (see Koyama et al., 2006). 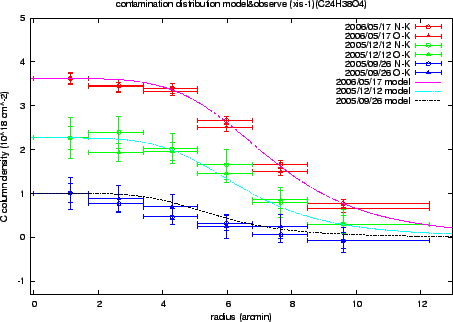 Figure 6.7: An empirical model for the on-axis contamination evolution, assuming DEHP (C24H38O4, or C/O = 6 by number) as contaminant. Crosses and open circles indicate the C column density of the contaminant derived from the E0102 72 and RXJ 1856 observations, respectively. Dotted lines indicate the best fit empirical model to the time evolution of the contamination for each sensor. These results, the empirical models of the contamination thickness in particular, are implemented in Suzaku analysis software. The instrument team discourages the use of XSPEC models to describe this extra absorption (such as xisabs, xiscoabs, xiscoabh, xispcoab) but rather the use of a modified .arf file in which the absorption is taken into account. Figure 6.8: Time evolution of the radial profile of the contamination thickness derived from N and O fluorescent lines from the day earth (i.e. Sun lit Earth)) atmosphere. Each color indicates the profile at three epochs from just after ``XIS door-open'' to the recent AO1 observation. Open circles and filled triangles represent the data points determined by the N and O fluorescence lines, respectively. The best fit model is also shown in the figure. Note that, for the on-axis column densities, the results in Figure 6.7 are used. Such an .arf file can be generated with the Suzaku ftool xissimarfgen. Detailed description is found in Ishisaki et al. and the Suzaku web site. For diffuse sources, one need to make arf with xissimarfgen considering the extension of the source. In this case, one should not include xisabs, xiscoabs, xiscoabh, xispcoab in the spectral fit. Calibration of the efficiency degradation due to the extra-absorption is still under progress. For example, relative contribution of oxygen to carbon has not yet been determined accurately. At present, we adopt the ratio of 1/6 in above models, but there are indications that the ratio is different for each sensor or changing in time. We also know, for some sources, the effective area decrease is evident above 2 keV (typically 5%), where our current absorption models with carbon and oxygen predicts little effects. We might need further study on this point. Furthermore, the radial profile of the extra absorber has been studied in detail only for XIS1 (BI-CCD), but not in detail for other sensors. Future prospect of the efficiency degradation is difficult to predict. However, extrapolation of the current evolution curves (Figure 6.7) will be appropriate for the proposals. For the AO-2 proposers we are going to provide the arf in which efficiency degradation expected on 2007 August is taken into account. These arf's will be generated with xissimarfgen. The arf's for diffuse sources should be generated with xissimarfgen by proposers. All four XISs have low backgrounds, due to a combination of the Suzaku orbit and the instrumental design. The large effective area at Fe K (comparable to the XMM-Newton PN) combined with this low background make Suzaku a powerful tool for investigating hot and/or high energy sources as well. In the XIS, the background originates from the cosmic X-ray background (CXB) combined with charged particles (the non-X-ray background, or NXB). Currently, flickering pixels are a negligible component of the background. When observing the dark earth (i.e. the NXB), the background rate between 0.4-12 keV in is 0.1-0.2 cts/s in the FI CCDs and 0.3-0.6 cts/s in the BI CCD. Note that these are the fluxes after the grade selection is applied with only grade 0, 2, 3, 4 and 6 selected. We show in Figure 6.9 the NXB spectra for each sensor, and their magnifications in Figure 6.10. 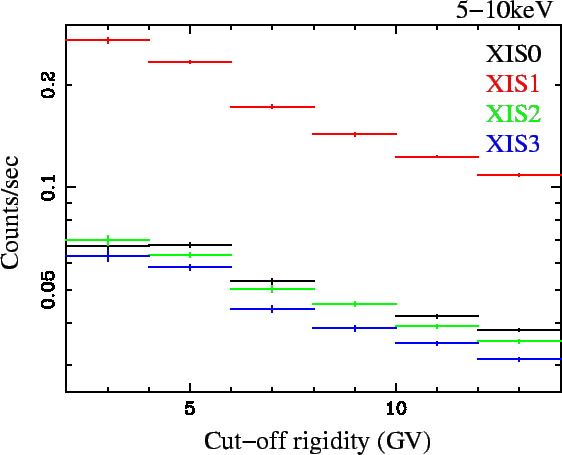 Figure: The XIS background rate for each of the four XIS detectors, with prominent fluorescent lines marked. These spectra are based on ks of observations towards the dark Earth. 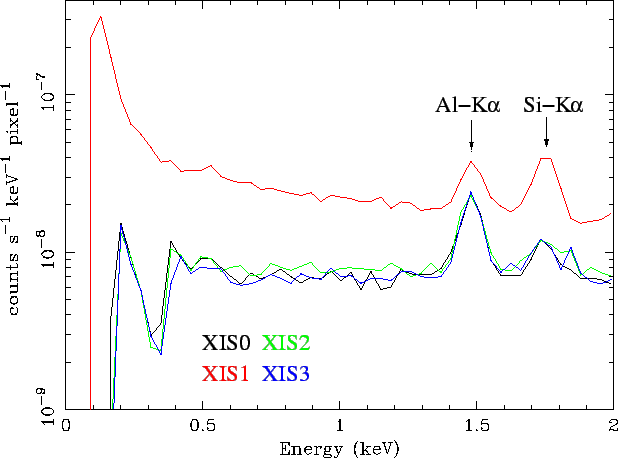 Figure 6.10: The XIS background rate for each of the four XIS detectors, showing only energies between 0.1-2.0 keV. Below 0.3 keV the background rate for the FI chips cannot be determined due to their low effective area. Note that these are the fluxes after the grade selection is applied with only grade 0, 2, 3, 4 and 6 selected. There are also fluorescence features arising from the calibration source as well as material in the XIS and XRTs. 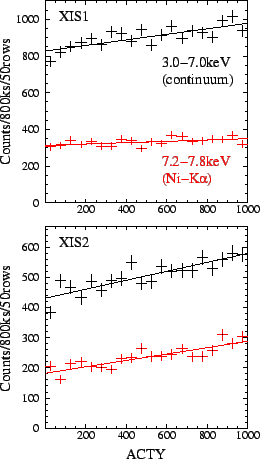 The Mn lines are due to the scattered X-rays from the calibration sources. As shown in Table 6.2 the Mn lines are almost negligible except for XIS-S0. The O lines are mostly contamination from the day earth (§6.9.3). The other lines are fluorescent lines from the material used for the sensor. Table 6.2 shows the current best estimates for the strength of these emission features, along with their 90% upper and lower limits. The NXB is not uniform over the chip. 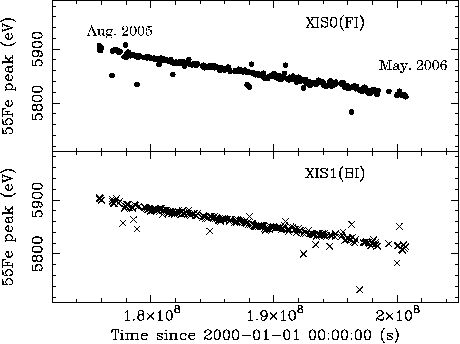 Its flux tends to be slightly higher at larger ACTY as shown in Fig. 6.11. This is because some fraction of NXB is produced in the frame-store region. The fraction may be different between the fluorescent lines and the continuum. This causes slight difference in the ACTY dependence of the NXB. Total flux of NXB depends on the cut-off rigidity (COR) )as shown in Fig. 6.12. This may be natural as the NXB is produced by the charged particles, whose flux is higher at lower COR. This means that, when we use the NXB database to subtract the backgroud, we need to select the NXB with an appropriate range of COR, which match with the COR distribution of the on-source observations. For this purpose, the NXB database available from the Suzaku web page is sorted with the COR. Figure 6.11: ACTY dependence of the NXB for XIS1 and XIS2. The NXB flux tends to be higher at larger ACTY, because some fraction of NXB is produced in the frame-store region. When we estimate the telemetry ocupation of the background, we need to consider not only the X-ray grades (0, 2, 3, 4, 6) but also non-X-ray grades (1, 5, 7). Although the class discriminator removes a large ftaction of non-X-ray background, we still have a non-negligible flux of the background. The background rate on the FI chips (including all the grades) is normally less than 10 cnts/sec and that of BI CCD is less than 20 cnts/sec. These values represent 90% upper limits of variations in the background count rates when the class discriminator is applied. These background rates are important when evaluating the possibility of the telemetry saturation at the low data rates (§6.9.4). The XIS is essentially a position-sensitive integrating instrument, with the nominal interval between readouts of 8 s. If during the integration time more than one photons strike the same CCD pixel, or one of its immediate neighbors, these cannot be correctly detected as independent photons: this is the phenomenon of photon pile-up. Here, the modest angular resolution of the Suzaku XRT is an advantage. However, photon pile-up could be a problem when observing bright sources. If the pile-up occurs, both the image and spectral data are distorted. The energy spectrum tends to become harder from the following reason. In most cases, soft photon flux is much larger than the hard photon flux. This means that, when pile-up occurs, soft photons tend to pile up rather than the hard photons. When soft photons piled up, they may be either discarded as a non-X-ray event or regarded as a signle hard photon. This results in the flux decrease in the soft band and the flux increase in the hard band. The pile-up tends to harden the energy spectrum. Because the decrease of the soft photons overwhelm the increase of the hard photons, the pile-up tends to decrease the total photon flux. In an extreme case, all the events may be discarded as non-X-ray events at the image center, and the local photon flux becomes effectively zero. This means that a point source image would have a hole at the center. This is the simplest method to detect the photon pile-up. Because the impact of the pile-up to the energy spectrum is different from source to source, it is difficult to give a general criteria of photon pile-up applicable to any sources. For example, if one tries to look for a weak hard tail in a soft source, photon pile-up may be strictly removed as it can easily mimic the hard tail. On the other hand, a heavily absorbed source with a hard spectrum may be rather insensitive to the photon pile-up. However, some kind of guideline might be useful for the guest observers to roughly estimate the significance of pile-up. We will give detailed estimation later, but the results may be summarized as follows. In practice, point sources with cts/exposure can be observed in the normal mode (full window). For somewhat brighter sources, window options can be used to reduce the exposure time per frame (the count rate limit is inversely proportional to the exposure time -- 1/4 window option reduces the exposure time from 8 s to 2 s, and raises the limit from cts/s to 50 cts/s). Detailed calculation of photon pile-up is give in Table 6.3. In this table, we summarize the estimated count rates at which the pile-up fraction in an annulus reaches , , and %. For example, for a source with the expected count rate of cts/s, % of the events within pixel of the image center are piled up. On the other hand, the pile-up fraction is restrained below 20% outside the circle of 20 pixel in radius. Note that the attitude fluctuation of the satellite does not mitigate the photon pile-up, because the attitude drift is negligible within the exposure of 8 sec. Note: in unit of cts/s. 1 pixel = 1.04 arcsec. When pile-up occurs, the effects need to be removed in the course of the data analysis. Most simple method is to remove the image center from the event extraction region. This means that the events are extracted from an annular region to calculate the energy spectra. In this case, an appropriate arf file need to be calculated depending on the inner/outer radii of the annulus. X-ray photons detected during the frame-store transfer do not correspond to the true image, but instead appear as a streak or blur in the readout direction. These events are called out-of-time events, and they are an intrinsic feature of CCD detectors. Similar streaks are seen from bright sources observed with Chandra and XMM-Newton. Out-of-time events produce a tail in the image, which can be an obstacle to detecting a low surface brightness feature in an image around a bright source. Thus the out-of-time events reduce the dynamic range of the detector. Since XIS spends 25 ms (without CI) and 156 ms (with CI) in the frame-store transfer, about 0.3% ( ; without CI) and 2.0% (with CI) of all events will be out-of-time events. However, because the orientation of the CCD chip is different among the sensors, one can in principle distinguish a true feature of low surface brightness and the artifact due to the out-of-time events by comparing the images from two or more XISs. When the XIS field of view is close to the day earth (i.e. Sun-lit Earth), fluorescent lines from the atmosphere contaminate low-energy part of the XIS data, especially in the BI chip. Most prominent is the oxygen line, but the nitrogen line may be also noticed (see Fig. 6.10). These lines may be mostly removed when we apply the standard data screening criteria (XIS FOV is at least 20 degree away from the day earth) during the ground processing. However, the flux of the atmospheric fluorescent lines are more or less variable and could become rather large depending on the solar activities. Small amount of contamination could remain after the standard data screening. Even in this case, the lines may be removed if we subtract background extracted in the same XIS field of view. If background data from other observations or the background database are used, the background subtraction may not completely eliminate the atmospheric lines. In this case, the data screening criterion, i.e. 20 degree from the day earth, may need to be changed. If a large number of events are detected in a frame, only a part of the events is output to the telemetry. The data which cannot be output to the telemetry are discarded. This phenomenon is called a telemetry saturation. Current telemetry allocation among the XRS/XIS/HXD detectors is summarized in Table 6.4. Although the XRS is not functioning, small amount of telemetry is allocated to monitor the HK data. The ratio depends on the data rate and may be changed in future. Due to staffing constraints, the available telemetry is slightly lower over the weekend. ``High'' rate telemetry is always 144 kbits/s, but ``Medium'' rate is 60 kbits/s during the week and 25 kbits/s over the weekend. Therefore, mission operation team tries not to allocate bright sources in the weekend. Because the on-board XIS data are processed in unit of 8 seconds in accordance with the standard exposure time, the available telemetry per sensor is 36864 byte in data rate ``High'', 15360 byte in the data rate ``Medium (weekday)``, and 6400 byte in data rate ``Medium (weekend)``. Here we assume an equal distribution of telemetry allocation among the 4 sensors. As the HK data and the frame header occupy some constant fraction of the telemetry, the rest is allocated to the X-ray events. We list in table 6.5 a typical size of an event in each editing mode. Because the event is lightly compressed on board, the event size listed in the table should be regarded just representative values. The event compression efficiency depends on the grades of the events, thus the spectral shape of the source. Table 6.6 shows the estimated telemetry limits of XIS in various editing modes and the telemetry data rates. We take into account fluctuation of the count rate. The upper limit of source count rate can be estimated by subtracting the background count rates (10/20 cnts/s for FI/BI at 90% upper limits) from the values in Table 6.6. Note: Nominal telemetry allocation for XIS and its equal distribution among the 4 sensors are assumed. Values in the parenthesis are maximum mean count rates which do not cause telemetry saturation even if the 3 statistical fluctuation is considered. When we consider an appropriate XIS clock/editting mode for a target, we generally need to consider both the telemetry limit and the photon pile-up. However, only the telemetry limit may be concerned for the diffuse sources, which are more extended than the angular resolution of the XRT. We give the recommended editing mode for a give data rate for a diffuse source in Table 6.7. In the table, we consider fluctuation of the source count rate and the contribution of the background count rate. Here we assume that the source count rates for the FI CCDs are nearly equal to that for the BI CCD. However, the ratio of source count rates depends on the energy spectrum. In case of the ratio of , the boundaries of the source count rate is changed by a factor of and some of telemetry modes cannot be used. Count rate for a single XIS sensor. Difficult to obtain useful data due to the telemetry saturation, unless output event rate was reduced, e.g., by the area discriminator. GOs cannot select the data rate. We summarize the recommended XIS modes for a point source in Table 6.8. Here we adopt 20 cts/s as a pile-up limit, which corresponds to the pile-up fraction of % at pixel from the image center. However, as explained previously, appropriate pile-up limit depends on the spectral shape of the source and the science goal of the observations. If a pile-up needs to be avoided completely, one should consider using the window option even if the source count rate is cts/s. For a source brighter than cts/s, it may be difficult to avoid the photon pile-up and/or the telemetry saturation. Guest observers who plan to observe very bright sources should consult with the Suzaku personnel at ISAS/JAXA or the NASA Suzaku GOF for the optimal observation mode. Out-of-time event due to the Spaced-row CI is not considered. Difficult to obtain useful data due to the telemetry saturation, unless output event rate was reduced, e.g., by selecting only one/two out of 4 sensors. GOs cannot select the data rate. In this section, we summarize the current status of the XIS flight calibration. Because the calibration information is updated frequently, it is expected that the description in this section may become obsolete quite soon. Latest calibration information may be found in the Suzaku web page. The XIS team has been calibrating mainly the and data in the normal mode, because they are the most frequently used modes. At the time of writing, we have just started the calibration of the data with the window and window+burst options including mode. However, calibration of the timing mode remains very preliminary stage yet. Since the introduction of the spaced-row CI may change the XIS performance largely, the XIS team will soon work on the recalibration of the CI data, which will be added to the current calibration data. In the followings, we describe the current status of the on-board calibration. The calibration items are as follows; (1) charge transfer efficiency, (2) energy scale, (3) energy resolution, (4) pulse height distribution function, (5) quantum efficiency at the low X-ray energy band (contamination) and (5) quantum efficiency at the high X-ray energy band. The CTI is increasing since the launch of Suzaku due to the irradiation of charged particles on-orbit. We continuously measure the center energy and FWHM of the main peak from the two Fe calibration sources. These calibration sources illuminate CCD segments A and D at the far corners from the read-out nodes. Figure 6.13 shows the on-orbit time history of the center energy of the main peak. The apparent linear trend is due to a charge loss caused by the gradual increase of the CTI. Thus, we measured the CTI with the observation of the calibration source of Fe, the galactic center region, the Sgr C region and a couple of clusters of galaxies mainly using the iron band and the Cygnus loop for low X-ray energy band. Since the X-ray sources are diffuse extending over the FOV of XIS and have strong emission lines, they are suitable for the calibration of CTI as a function of the distance from the read-out node. Through the observation, we update the relevant correction parameters regularly and keep the absolute energy error within % at the iron K energy and within eV below 1 keV, successfully. The energy scale was verified with the PV data of some clusters of galaxies and E0102-72 for the iron and oxygen bands, respectively. As of Oct. 1, 2006, the calibration at keV band including silicon edge is rather poor. This is the main uncertainty in the energy scale calibration, which may be improved soon. 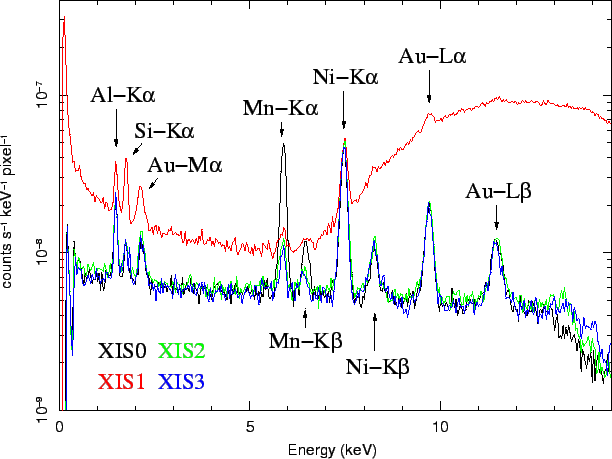 Figure 6.13: The time history of the center energy of Mn K from the Fe calibration sources for XIS0 (FI) and XIS1 (BI). The calibration of degradation of the energy resolution with time is done with the calibration source of Fe and E0102-72 and is verified with the data of the galactic center region and the Cygnus loop. Figure 6.14 shows the time history of the energy resolution of the main peak of the calibration line of 5.9 keV X-ray irradiated at the edge of the detector. Figure 6.14: The time history of the energy resolution for Mn K from the Fe calibration sources for XIS0 (FI) and XIS1 (BI). Against the pre-flight energy resolution of eV at keV, Figure 6.15 shows the ``extra'' line width obtained with the data of E0102-72 by comparison with those from the Chandra HETG. Figure 6.15: The time history of the ``extra'' line width at O-K band against the pre-flight energy resolution of eV in FWHM. Evolution of the XIS energy resolution may be expressed by the following formula. Positional dependence of the energy resolution is negligibly small at present compared to its accuracy of determination. This formula is simply obtained by introducing a time dependence to the coefficients of the incident X-ray energy . While is read-out noise fixed to the value obtained with the ground calibration, the time variable parameters of and are determined with the data of Fe and E0102-72 mentioned above. Main source of the degradation in the energy resolution is the column-to-column variations of the CTE. CTE of each column can be measured with high accuracy and efficiency using the charge injection. Thus, CTE can be corrected for each column. The XIS team has been measuring the CTI of each column once or twice every two months from May 2006. The degradation of the energy resolution may be incorporated in rmf. Guest observers can make the appropriate rmf for their observations using xisrmfgen, which is not yet relaesed as of Oct. 1, 2006, but will be released soon. In spite of the degradation of the energy resolution, the XIS team dose not expect to change the pulse height distribution function (line profile to the monochromatic X-rays) on-orbit except for the energy resolution. The results from the pre-flight ground experiments are used in xisrmfgen. The contamination is the main issue related to the calibration of the quantum efficiency at the low X-ray energy band. The status of the calibration is found in the section 6.7. The calibration of quantum efficiency above keV is done mainly with the Crab nebula. The current status is given in the section of XRT.